Japanese people are very passionate and artistic when it comes to food. That is why Japanese cuisine has gained popularity and is well-loved by a lot of people from all over the world. They are known for their raw foods and these include nigiri and sashimi. Though these types of Japanese dishes are well-known, a lot of people still get confused between the two. 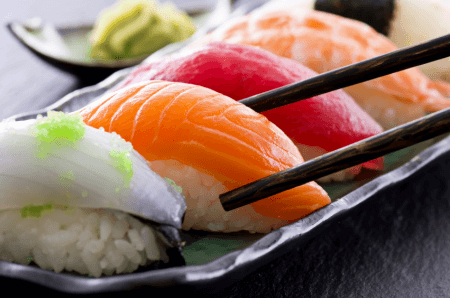 In this article, we’ll provide you with the information that would help you to clearly distinguish between nigiri and sashimi. Nigiri is a type of sushi consisting of a slice of raw fish pressed over vinegared rice. It is also referred to as “hand-pressed sushi.” In Japanese, nigiri means “two fingers,” with ni meaning “two” and giri which stands for “fingers.” When preparing the dish, the rice should be of a particular quantity. The amount of rice for each piece of nigiri must be enough to fit the chef’s two fingers when pressing down on the rice. Nigiri is always served with seafood. Apart from raw fish, it and can also be prepared with octopus, shrimp, and squid but not meat. The seafood on top of the rice is often served raw but can also sometimes be cooked or seared. When serving nigiri, it is usually not garnished with anything else. However, it can be eaten with wasabi, soy sauce, or pickled ginger. It is perfectly normal to eat nigiri with bare hands instead of chopsticks. Sashimi refers to thinly sliced raw fish. 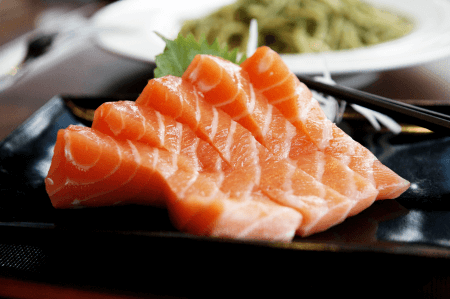 The most commonly served sashimi is salmon or tuna. However, in Japan, sashimi is not confined only to fish but includes certain types of meat. They also serve horse meat, beef, pork, chicken, deer, sea turtle, and frog meat. Sashimi is a Japanese expression referring to the act of preparing the dish with sashi meaning “sliced or pierced” and mi referring to “body or meat.” Sashimi is served without rice. Similar to nigiri, it can also be eaten with wasabi, soy sauce, or pickled ginger. But unlike nigiri, sashimi is usually garnished with daikon radish, shiso leaves, and toasted nori (seaweed). Chopsticks are used to eat sashimi. What is the difference between nigiri and sashimi? Nigiri is a type of sushi which is a slice of raw fish or any seafood over vinegared rice. Sashimi, on the other hand, is just a slice of raw fish or other raw meat without any rice. The seafood in nigiri is usually raw but can also be cooked or seared, unlike sashimi, which is always served raw. Nigiri is not garnished with anything and just presented as is compared to sashimi which is often garnished with daikon radish, shiso leaves, and toasted nori. Chopsticks are used to eat both nigiri and sashimi, although, it is also perfectly normal to eat nigiri with the hands.